Do these cute little guys remind you of something? I think we all had one or two of these when we were younger. Those of us that fall into that mid-century category anyway. My excuse for collecting them is that I have two daughters. Yeah right. Most of these are Dakin Dream Pets. I find something so appealing about these little guys. I think it's partially the velvety material they are constructed from and that they are stuffed with sawdust till they are firm so they stand up. I had to research some history on these guys, and I found it kinda interesting. I found this info on Cuddly Collectibles. The year was 1957. Sputnik was launching into space, Leave It To Beaver was a TV favorite and Elvis was rockin' the air waves. All this, while a young man in Detroit, Barry Gordy, took his last $700 to form Motown. R. Dakin & Company began importing electric trains. The early trains were packed with six small (quirky) velveteen stuffed critters whose intended use was to cradle the trains on the long journey. Unexpectedly, these sawdust-filled funsters created more excitement than the trains they were intended to protect. 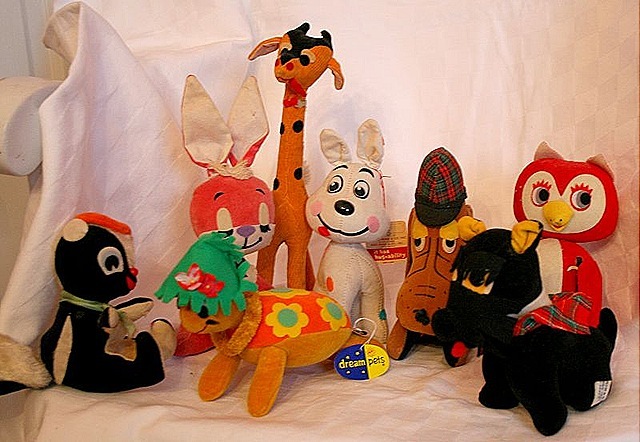 R. Dakin's packing material, Dream Pets – the Original Stuffed Toy – were about to become a cultural icon adored by everyone around the world. As popularity and demand for Dream Pets grew over time, so did the Dream Pet community. By the mid-seventies, there were over 2000 different Dream Pets born, to fulfill the fantasies and capture the imagination of millions. Of course I have Christmas Dream Pets. hoorah. I've got a regular little herd of reindeer here. The expressions are priceless. I have sold many of those Dream pets over the years~ I never thought to keep them all, you have a super collection! love the Christmas linens too! It’s the strangest thing, because this is clearly my era, and I have no recollection whatsoever of these! I missed out on a cultural icon? I’m feeling just a little deprived. I’m going to go call my mom and confront her. I love the deer!! They are too cute! I love the reindeer they are so cute. I do remember these but unfortunatly they didn’t make throught the nine of us kids. Yippie Skippy for posting these! I had a pink hound dog that I loved beyond belief. With my frugal Dad it was the only one I got! Thanks for these wonderful photos and memories! E Happy Holidays to You! my boyfriend gave my 5 of these last year for christmas… i never heard of them until then. it was such a sweet gift. i have a horse, octopus, fish, bumble bee, and sea horse. Those are some crazy lookin’ deer! Love the new header. I’ve always passed over these animals when I saw them in the thrifts. I’ll take a closer look from now on. I absolutely LOVE your precious reindeer! I don’t have any of those but I have some Pixies from the same ‘era’! Love the reminders of my childhood! Very sweet! LOVE the deer, and the banner! I have two of the dogs-so fun! I just spent about an hour on the phone with my sister describing your sweet reindeer! She doesn’t have a computer! I tried to help her imagine each face of every little red deer…and green! It was a HOOT! 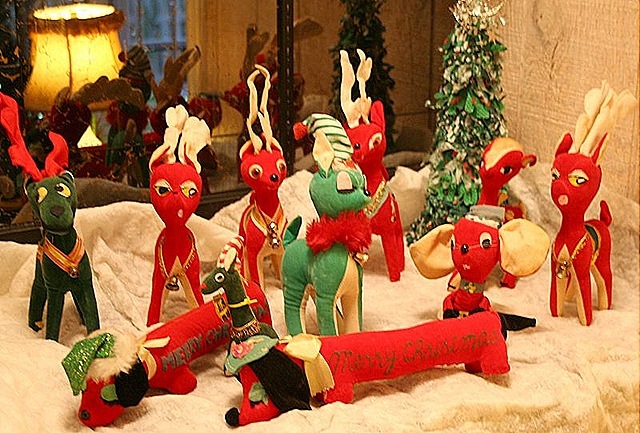 She collects pixies( and I have a few ) and the reindeer look like they are from the same era! So sweet! I have one of those long doggies, but no reindeer, so cute! I have a reindeer that belonged to my grandmother. It just isn’t Christmas until I put it out on our dining table every year!